A common misconception is that rabbits are dirty animals. But rabbits make wonderful indoor companions in part because they can be litter box trained, just like cats! Follow these steps to litter train your rabbit. Provide a small cat litter box (or a few) with low sides and no top. You can also use a shallow storage tub. Cut a doorway in one of the sides if it’s too tall. Don’t bother with the corner litter boxes advertised for bunnies, as they are too small. For litter, use recycled paper litter such as Yesterday’s News. You can get the larger bags made for cats, but choose the unscented version. This litter will neutralize any unpleasant urine odors. Do not use clay-based or clumping litter as this is harmful to rabbits’ respiratory systems. Avoid wood shavings as well. Put a thin layer of litter at the bottom of the litter box- just enough to absorb wetness. There’s no need to fill it too high since rabbits don’t bury their droppings like cats. Plus, when you clean the litter box, you dump the entire contents out each time. So you will unnecessarily go through a lot of litter if you deeply fill the box each time. Rabbits like to eat hay and poop at the same time. So to promote good litter box habits, place hay either directly in the box over the litter or place it in a hay box next to the litter box. 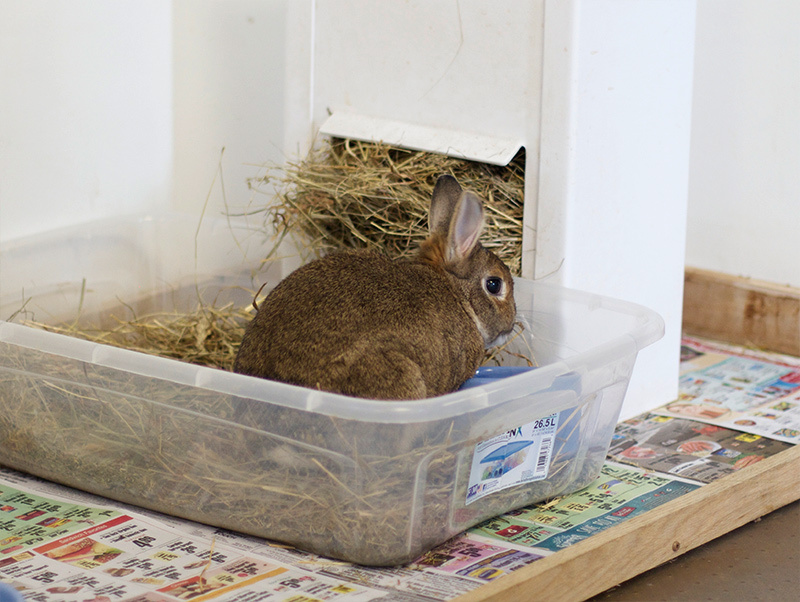 If you use a hay box, position it so the rabbit must hop into the litter box in order to reach the hay. It’s easiest to develop good litter box habits in rabbits by limiting their space at first. Use a puppy pen to confine your rabbit to one area, even if you intend to give him/her free reign of your home eventually. This allows your bunny to get acclimated to the area in the beginning. Once your bunny consistently uses the litter box, you can gradually expand the area. If your rabbit starts “forgetting” to use the litter box, then limit the space again until good habits resume. If accidents occur, mop up urine with a paper towel and pick up stray poop and place both in the litter box. This helps get the message across that the litter box is the place that they should do their business. Keep in mind that rabbits are generally not 100% perfect with their litter box. Sometimes they leave a few droppings next to the box, or they urinate over the edge of their box. This is normal, so placing a plastic mat under their litter box or putting the litter box on a tile floor makes it easier to clean up these little mistakes. Be patient and persistent. Litter training takes time, especially if your rabbit has learned bad habits. It takes a while to retrain them. If you can see they’re about to go outside their litter box (they may lift their tail or sometimes they sort of shimmy down in a seated position right before they go), try to pick them up and put them in the litter box or corral them in. This is oftentimes easier said than done of course. If your bunny is insistent on going in one corner of the room, sometimes it’s easier to give in to their stubbornness, and place a litter box in that corner. Sometimes when rabbits consistently choose another place to go, they are trying to tell you that that’s where they want to go. If your rabbit is pooping/spraying pee everywhere, this is probably due to your rabbit marking his territory. It’s a good idea to get your rabbit spayed/neutered in order to ease territorial feelings. Sometimes rabbits deliberately pee on your couch or bed because they’re showing you who’s Top Bunny in the house. You should correct their misconception immediately. See our article, Rabbit Peeing on the Couch? What to Do and the House Rabbit Society’s article, “FAQ: Training” for more information. Litter training your pet rabbit takes patience and persistence. But in the end, you’ll have a wonderful companion to share your home with. Abi Cushman is a contributing editor of My House Rabbit and Animal Fact Guide. When she's not writing about pet rabbits or weird animals online, she writes and illustrates funny books for kids [about rabbits and weird animals]. 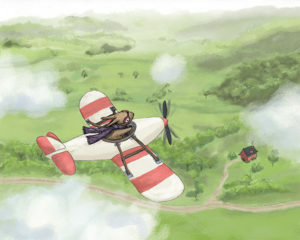 Her debut picture book, Soaked , comes out in Summer 2020 from Viking Children's Books. Thinking About Getting a Pet Rabbit?